C.E.T. Toothpaste is specially designed for dogs and cats and is very tasty. 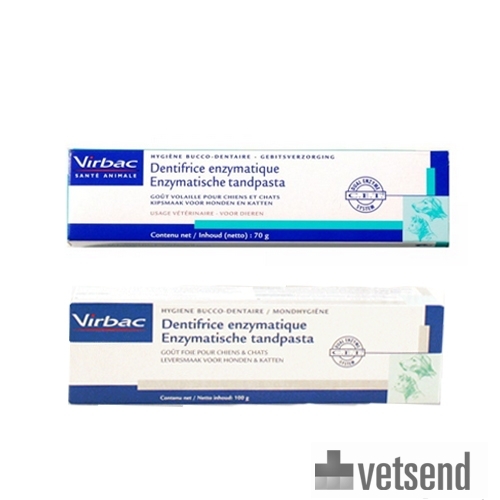 Regular brushing with Virbac C.E.T. Toothpaste prevents plaque, tartar build-up and bad breath. For best results, it is recommended to brush the teeth daily. C.E.T. toothpaste contains the patented C.E.T. Dual Enzyme System that activates and stimulates the mouth's natural immune system. Rinsing after brushing the teeth is not necessary. Please note: The liver flavoured toothpaste has a more liquid consistency than the chicken flavoured toothpaste. Patented C.E.T. Dual Enzyme System (glucose oxidase and lactoperoxidase, potassium thiocyanate). Soft polishing materials with chicken flavour. Surface-active agents (glycerine, sorbitol), dextrose, xanthan gum and sodium benzoate, and chicken flavouring. Have you used C.E.T. Toothpaste before? Let us know what you think about this product.